At YESS our vision is to walk beside traumatized youth on their journeys towards healing and appropriate community integration. This doesn’t just apply to youth workers in Programs—it applies to every department across YESS! And just like many other folks would say about their own homes, what happens in the kitchen is a huge part of the heart of our work at YESS. We sat down with YESS Chef Scott Iserhoff to talk about his experiences in creating a space where youth can heal through his culinary calling. Scott studied culinary arts and hotel management in Ontario and has been a chef for over 15 years. But his love of food and community goes back farther than that. “Cooking is an integral part of my Indigenous culture. My first exposure to food was through eating wild meat with my family and smoking goose over the fire with my grandparents,” says Scott. How does Scott bring this same powerful feeling he first experienced in childhood to his work at YESS? Almost half of the youth who access YESS identify as Indigenous and Scott takes every opportunity he can to share culture and connection with all our youth. Last year we announced that our focus would move more towards trauma-informed care. This has started to reach out from youth programs to touch other areas of YESS to align all teams with what it means to walk beside youth on their journeys towards healing. This includes the kitchen in a major way. In his two years at YESS, Scott has impacted hundreds of young lives through food and culture, making YESS a safe and healing space for youth who have experienced trauma. What has Scott taken away from the time he has spent with youth? The special way that YESS chefs Scott, Reddy, and Cherish honour their work in the kitchen shows in the ways our youth experience food, build trust, and heal through relationships. Preheat the oven to 425. Toss butternut squash with olive oil and salt and pepper and roast on a baking sheet until fork-tender (20ish minutes). In a heavy-bottom skillet, melt the butter and add the shallots. Cook for 2 minutes. Add the kale and cook until wilted. Remove from pan and set aside. Whisk together mustard, thyme, eggs, and 1/2/ & 1/2. Set aside. 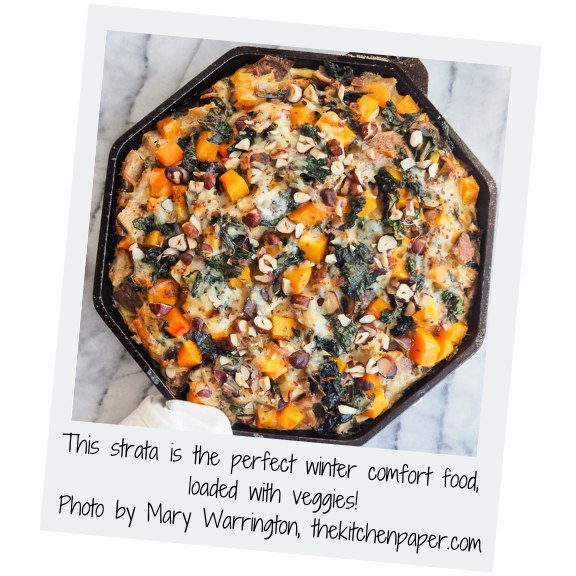 Arrange the bread, squash, kale mixture and cheese in layers in the skillet, reserving a handful of cheese for topping. Pour the egg mixture over everything in the pan. Let the bread absorb the eggs for a few minutes (up to an hour in the fridge). Reduce the oven to 350. Cook the strata for 45-55 minutes, or until the center is no longer wobbly. Add the reserved cheese and broil for a minute to crisp everything up. Let cool for a few minutes, top with hazelnuts and serve.